U.S. housing starts remained stable at a seasonally adjusted annual rate of around 1.2 million units in the last few months. In November 2018, while multifamily housing starts were up about 25%, single-family housing starts dropped about 5%, resulting in just a 3.2% increase in the overall rate of housing starts, compared to October 2018. In the fourth quarter of 2018, South-wide average stumpage prices were up for all major timber products, except for pine chip-n-saw, mainly because of wet weather led by Hurricane Michael in the southeast region. In terms of annual price trends, in 2018, southwide average pine sawtimber price was up about 1%, but pine pulpwood price was down 3% from a year ago. Both hardwood sawtimber and pulpwood were up in 2018. In the lumber markets, both Southern pine and hardwood lumber prices continued to decline in this quarter. The price of Southern pine lumber was $375 per thousand board feet, down 14% from last quarter and down 10% from last year. While both crude oil and diesel prices were down, natural gas prices were up in this quarter. In the fourth quarter, North Carolina state-wide average timber prices were up except for pine sawtimber and chip-n-saw. According to TimberMart-South, the average pine sawtimber price was $24.8 per ton, down 5.1% from last quarter but up 4.8% from the price a year ago. It was still about 2.3% above the south-wide average pine sawtimber price of $24.0 per ton. Pine sawtimber prices in both Eastern and Western North Carolina fell in this quarter. 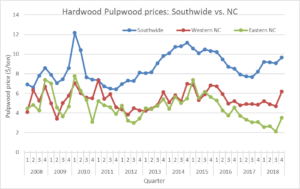 After an about 11% drop in the last quarter, pine pulpwood prices in North Carolina slightly improved in this quarter. The state-wide pine pulpwood price averaged $10.4 per ton, up 2.3% from last quarter. The average pine pulpwood price in Eastern North Carolina was $13.2 per ton, up 3.9% from last quarter but down 1.9% from the price a year ago. The hardwood sawtimber price increased slightly at the state-wide average of $24.7 per ton in this quarter. The hardwood pulpwood prices bounced back substantially to the state-wide average of $4.8 per ton, but it is still 50% lower than the South-wide average price of $9.7 per ton. The hardwood pulpwood price in Eastern North Carolina was $3.5 per ton, up 65.1% from last quarter. For more information on the 2018 fourth quarter stumpage prices in North Carolina, please visit the Quarterly Price Report web page. • State-Wide Timber Prices Continue to Drop for Major Products During Second Quarter of 2017.